If you are a sinner, which you are, I am about to scare you to death, literally! 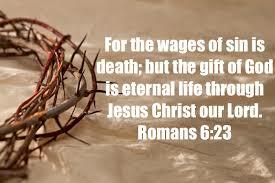 …Read the second part of the verse, and you are given a GIFT of eternal life through the sacrifice that your Saviour Jesus Christ made on the cross. He died on the cross for us, so that even though we sin, if we ask for forgiveness and believe in Him, He will forgive our sins AND give us the gift of eternal life. I’ve found MY loving God. Have you?